DFRobot FireBeetle series are low power consumption microcontrollers designed for Internet of Things (IoT) development. FireBeetle Covers-DC Motor & Stepper Driver is a DC motor & Stepper Motor driver designed for FireBeetle Microcontrollers. It can control up to four-channels DC motors / two-phase four-wire stepper motors simultaneously. The motor driver cover integrates a STM8 as its coprocessor, controlling the motor speed and direction. It communicates with Microcontroller via IIC port, supports up 1000Hz refresh rate. The assisted processor STM8 controls motors and set the main control free. It effectively reduces the dependence on MCU pin resources and MCU occupancy. Independant motor control make the multi-motors projects more affordable. 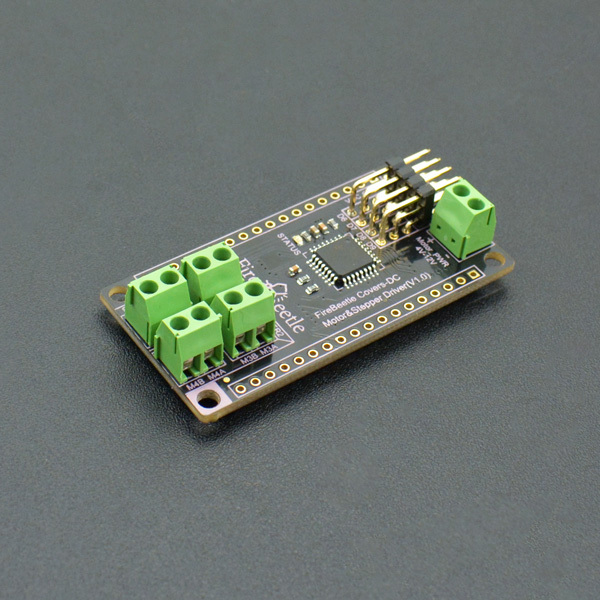 Cooperate with DFRobot Arduino Motor Library, it will reduce your development difficulty. This stepper motor driver adopts 2x TB6612FNG chips and performs excellent in low power consumption application. The consumption current is only 30mA under static state, and motor driver can provide 1.2A output current at 5V and the peak current is 3.2A@5V. Besides, the motor drive supports 4~12V wide-range power input. FireBeetle Covers-DC Motor & Stepper Driver also provides four independent interfaces to drive servo. So, you can control servo directly. It can be widely applied to intelligent car control and gear control. NOTE: The motor power supply must be independent from logic control power supplies! Provide 4-channel general motor drive interfaces (M1A/M1B, M2A/M2B, M3A/M3B, M4A/M4B). LED Mode1: Blink (frequency: 30Hz), indicating the motor drive chip is waiting for initialization commands from the host. LED Mode2: Lighting, indicating the motor drive chip works well (control motor operation and wait initialization commands from the host). LED Mode3: OFF, indicating communication error of the motor drive chip. Take FireBeetle ESP8266 board as an example at here, other Arduino control boards such as arduino UNO, arduino Mega… are also can be used. Please download and install FireBeetle Covers-DC Motor&Stepper Driver library files. FireBeetle Covers-DC Motor&Stepper Driver can control up to 4-channel DC motors simultaneously. There are 4 marked motor connectors: M1A&M1B, M2A&M2B, M3A&M3B and M4A&M4B. We’ll show you how to control a DC motor with a Firebeetle or Arduino board. Connect the DC motor to M1A&M1B port, M1A to anode and M1B to cathode. Generally, you need to connect a motor power (4~12V) to Motor PWR port, and connect a logic power (3.3~5V) to VCC & GND pins. If you use FireBeetle, you can plug the cover on the board, and connect the external power (4~12V). adjustment, brakes and so on. Program Function: the first group rotate in C.W. (Clockwise) for 2s and rotate in anti-clockwise for 2s, then stop for 2s and followed by recycling. Initiate the motor drive, read Product ID and Version ID, and print to the serial port. FireBeetle Covers-DC Motor&Stepper Driver can control two-channel two-phase four-wire stepper motors simultaneously. It adopts DC motor interface and control via IIC interface. The test explains the way demonstrates how to control a two-channel two-phase four-wire stepper motor by Arduino main board. Connect the stepper motor to STEPPER1 and the power supply of motor should be 4~12V, shown as below. Program Function: group A stepper motor (M1A(A+), M1B(A-), M2A(B+), M2B(B-)) reverse the rotation direction in every 2s. Create a stepper motor object. Set angle, speed, direction of the stepper motor rotation and start to rotate. angle: set the rotation resolution. The maximum resolution is  0.9°, which means the minimum rotate angle is 0.9°. So that the motor won’t rotate if the resolution set to be 0.1° and only rotate to 0.9° if the resolution set to be 1°. Min: 0° (if the rotate angel set to be 0, the motor will keep rotating). speed: set speed. The speed range is 0~1023. Set it to 0 and the rotate speed is 0r/min; set it to maximum 1023 and the rotate speed is 200r/min. FireBeetle Covers-DC Motor&Stepper Driver can control a stepper motor and 2 DC motors simultaneously and let them work independent to each other. The test explains the way to control both stepper motor and DC motors at the same time. Connect the stepper motor to STEPPER1 and DC motor to M4, shown as below. of D.C motors and stepping motor. Program Function: group A stepper motors (M1A(A+), M1B(A-), M2A(B+), M2B(B-)) reverse in every 3s and group 4 DC motor (M4A(+), M4B(-))reverse in every 1.5s. Create a DC motor object. Set the rotation direction of the DC motor and start to rotate. angle: set the rotation resolution. The maximum resolution is  0.9°, which means the minimum rotate angle is 0.9°. dir: set direction. dir=CW: rotate in C.W. (Clockwise) ; dir=CCW: rotate in anti-clockwise. The reverse function of group 4 DC motor. The reverse function of group A stepper motor. The library used to control DC motor and stepper motor, including C.W rotation, C.C.W rotation, speed adjustment and stopping. 1. Open drive hardware of DC motor and stepper motor, read Product ID and Version ID. 3. Stop the motor rotation. 4. Set the DC motor rotation direction and start rotating. 5. Set angle, speed, direction of the stepper motor rotation and start rotating. void start(float angle, uint16_t speed, uint8_t dir);angle: set the rotation resolution. The maximum resolution is 0.9° which means the minimum rotate angle is 0.9°. So that the motor won't rotate if the resolution set to be 0.1°and only rotate to 0.9° if the resolution set to be 1°. speed: set speed. The speed range is 0~1023. Set it to 0 and the rotate speed is 0r/min;set it to maximum 1023 and the rotate speed is 200r/min. Q How could FireBeetle Board-ESP32 control servos with Arduino? A ESP32 is incompatible with local servo library files of Arduino IDE itself, but you can download DFRobot Arduino-Servo library to enable servo drive. Q Why the program cannot be downloaded when plug the Motor Expansion Board? A FireBeetle-ESP32 Board V1.0 is conflict with the motor expansion board in RESET circuit. You need to unplug the expansion board to download and upload.And DFRobot fixed this problem in the following FireBeetle series. Get FireBeetle Covers-DC Motor & Stepper Driver_SKU_DFR0508 from DFRobot Store or DFRobot Distributor.